1 Put garlic, vegetables, thyme and broth into a large soup pot. Cover and bring to a boil over high heat; reduce heat to low and simmer, partly covered, about 10 minutes. 2 Stir in parsley or chives; season to taste with salt, pepper and lemon juice. If you like thick soups, consider pureeing this recipe in the pot with an immersion blender.There are so many variations on this recipe. 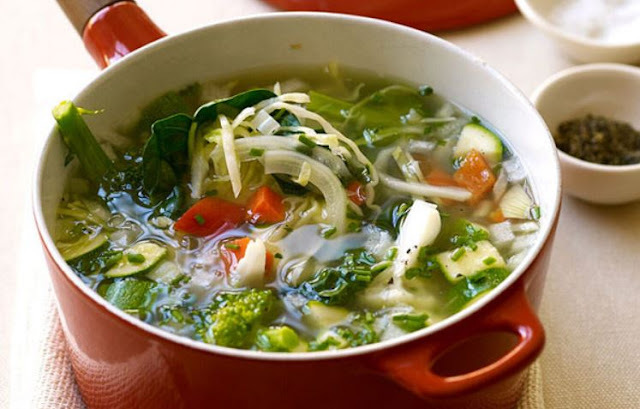 Add or leave out vegetables to suit your taste.Save time by using frozen vegetables instead of fresh ones (though the texture of the soup might change a bit). You can also buy small amounts of pre-cut vegetables from your supermarket’s salad bar.